Swimming, cycling and running — each can be quite a workout on their own, but doing them all together? Now that’s a challenge! Not only can signing up for a triathlon be especially intimidating for first timers — there’s also the training, gear and equipment to think about. 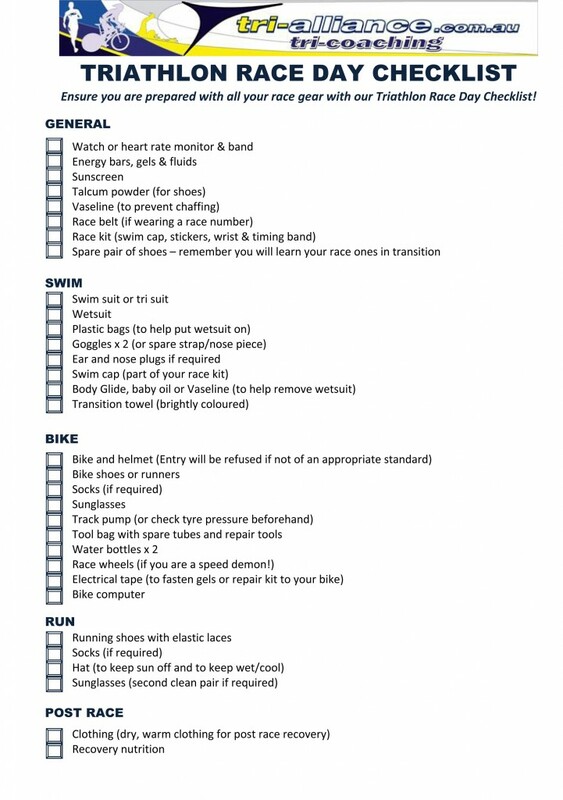 To make it easy, we’ve outlined everything you need as a beginner triathlete. To get started in triathlon, you can actually get away with minimal triathlon equipment. If you have bathers, goggles, a bike, helmet and runners, then you can get started straight away! So don’t let specific equipment or a super expensive bike stand in your way – grab your gear and get along to a training session. Remember we offer a FREE week training to try out our sessions, so there really is NO excuse not to get started! POOL TOOLS - Pull Buoy, Fins, Kick Board, Paddles and a Snorkel will be required. WETSUIT - are optional and are highly beneficial when swimming in cooler climates and if you need more buoyancy. If you are going to buy one, make sure it fits properly! BIKE - Any bike will do, as long as it's safe. BIKE - Any bike will do, as long as it's safe. Take the bike in for a basic service if you are unsure. WIND TRAINER- BYO or hire one of ours for $5. TOWEL - Trust us, you'll want a towel to wipe that sweat away! SHOES - ensure you have comfortable shoes that don't have damage to the sole. Our beginner triathlon training Melbourne programs cover all aspects of triathlon training and provide you with a taste of the technique and skills to compete this coming season. So if you have been thinking about trying a triathlon, now is your chance to get a head start before the next race. We know we can turn the beginner into a Triathlete regardless of age, background, fitness, skill level or otherwise. So if you have been thinking about trying a triathlon, now is your chance to tick it off your bucket list with this FREE six-week program.